In pattern with the recent posts, here’s a brief treatment of how to use a pistol as an impact weapon. Sure, shooting bullets is the primary way to use the weapon, but not all situations allow or call for such usage. Perhaps you’re out of bullets. Perhaps your gun jams and the bad guy leaps on you. Maybe the area behind your target isn’t clear, and you don’t want to risk hurting an innocent person. Whatever the case may be, there are plenty of situations in which you may want to use a pistol as an impact weapon rather than a projectile weapon. Anybody who has played a first-person shooter game in the last two decades is probably familiar with this move. It involves striking with the bottom of the handle. This is a perfectly natural movement as it is essentially just a hammer fist assisted by a hard object. 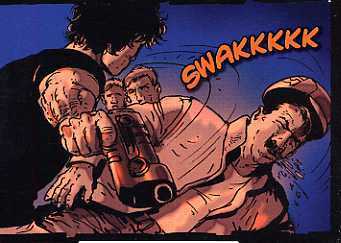 This is when you basically thrust the barrel of the gun into the other person. You can’t quite get the velocity or power that you can with the pistol whip, but it’ll hurt nonetheless…especially if you choose an effective target. Now, this isn’t meant to be like in the movies where the bad guy pushes someone with a gun in a way that maintains contact. This is more like a powerful break in a game of 9-ball. Hit and retract. Part of the reason for this is the slight (I emphasize…slight) possibility that if you maintain pressure on the barrel such that the slide moves back ever so slightly, some guns may not fire because the firing pin can no longer reach the bullet. Like I said, it’s rare, but I imagine that if you have your gun out then you want to take every precaution to make sure it does what you want it to, when you want it to. You can get a bit more velocity on this one than the barrel push. You swing the barrel of the gun like a little stick and hit the bad guy using any side of the barrel (top, sides, bottom…if you’re gun is long enough). If you hit with the top of the barrel, you might be able to get some bonus damage by raking the sights across the guy’s skin. The purpose or goal of hitting someone with a pistol in any of these ways can range anywhere from just hurting the guy to getting distance so you can get a clear shot off. It all depends on the situation. Maybe you don’t even want to shoot the guy. He may have rushed at you thinking you wouldn’t shoot, or maybe you hadn’t drawn yet. You slap the guy around a bit with the gun to let him know you’re willing to hurt him, you gain some distance, point the gun at him, and then let him quietly ponder his life choices as he realizes the seriousness of his situation. It should be noted that guns are precise machines (some more than others). Slamming your gun into a hard surface (like a skull) might cause things to get knocked out of place. So, be ready to clear any jams that might occur afterwards. My understanding is that semi-automatics, having more moving parts, are more finicky than revolvers. Perhaps doing some experimentation at a shooting range (they may not like you slamming your gun into the table so going out in the country might be better) would be a good idea. Another thing to be very careful of is the possibility of your gun going off because of the impact. Maybe the impact moves that firing pin just fast enough to pop that primer. All gun safety recommendations are still in effect. Be very aware of where your gun is pointing. Your intent might be just to hit, but your rickety old pistol might just go off when you do it. KNOW YOUR WEAPON. If you found this article eye opening, then you might also want to check out my similar article on alternate striking methods with knives.